Several British Olympic champions will compete in the Revolution Series in Derby in a bid to gain World Championship qualification points. British Cycling will field a full-strength team featuring Sir Bradley Wiggins, Laura Trott, Joanna Rowsell and Jason Kenny. 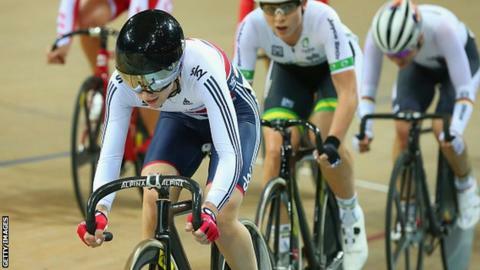 Ed Clancy, Steven Burke and Philip Hindes will also race at Derby Arena. The three-day event starting on 14 August is the first of six in the series. Wiggins will compete in the team pursuit and individual pursuit. British Cycling technical director Shane Sutton said: "You can expect every Great Britain track rider to be competing at the Derby round in August, barring injury. "The team enjoy racing at this level in the UK as the support of a home crowd really boosts morale and spurs them on, which is exactly what we saw in London 2012." After Derby, the series visits Manchester in October and London and Glasgow in November, before concluding with two more rounds in Manchester in January.